As a psychotherapist, Maggie McGill often had dealt with the ghosts of past deeds and past influencers on her clients, such as a domineering mother or an abusive father. She’d seen the actions of these long gone people haunt her clients and their issues. Now in Ireland, she wonders if there are other types of ghosts, as well. Maggie and daughter, Allie, explore their family history and find so much more. The monastery island, peaceful and green, waits for the pure of heart to discover its secrets. 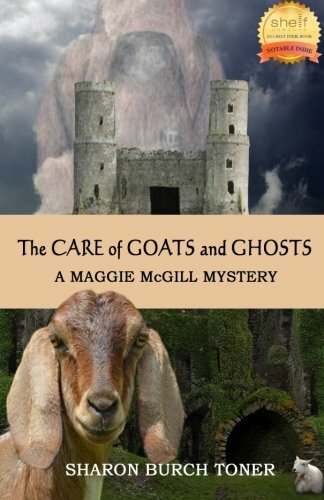 Maggie and Allie discover beauty, peace and, of all things, goats! It is idyllic until . . . Maggie must face a deep fear. She and Allie confront a mystery that deepens into even greater dangers. Sharon Burch Toner’s Irish grandmother gave her a lifelong appreciation for a story well told. She pursued a career as a psychotherapist for nearly twenty years before she turned to writing as her ideal occupation. She lives in California with her two feline roommates.